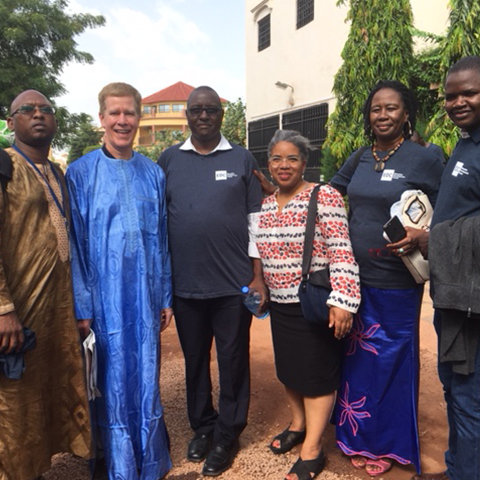 As part of EDC’s 60th anniversary year celebration, EDC President David Offensend visited programs, partners, and funders in Mali, where EDC has had a continuous presence for nearly 20 years. 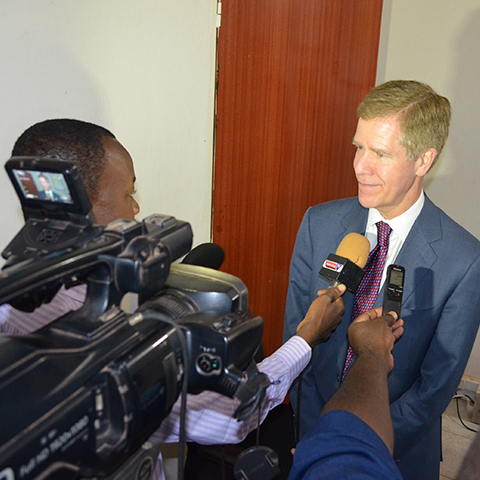 He also took part in an anniversary press event in Bamako that drew 25 TV, radio and print journalists. During the three-day visit, Offensend visited project sites implementing EDC programs. Over the past 20 years, EDC projects have addressed a range of challenges such as early grade reading, teacher training, and capacity building in communities, and have worked in hard-to-reach and conflict affected areas. Notable successes have included, for example, transitioning 90 percent of students in accelerated learning programs in the northern regions back into the public school system. 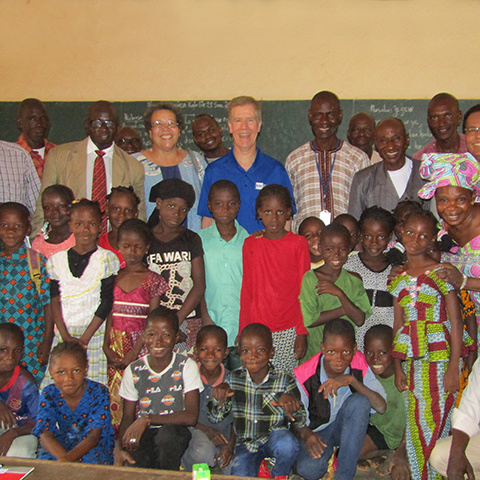 On a recent visit to Mali, EDC President Dave Offensend visited a 2nd grade classroom in Koulikoro, where virtually every child can now read and write, thanks to EDC and its partners. While in Mali, Offensend also met with EDC’s project team, which numbers more than 100 staff. EDC has worked in Mali for 20 years. 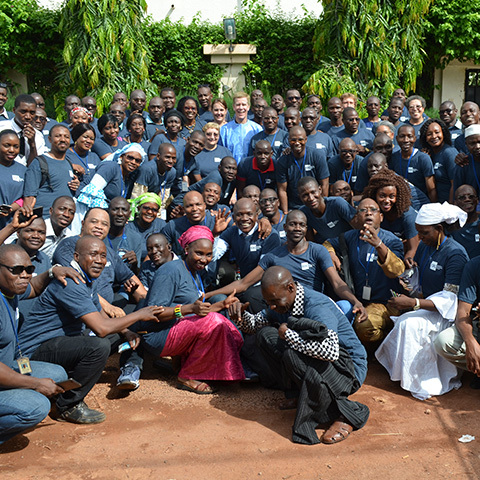 Offensend meets with members of EDC’s staff in Mali. During his visit, he was presented with a traditional garment called a boubou. In recognition of EDC’s 60th anniversary, 25 journalists attended a press conference in Bamako, Mali’s capital city, where Offensend was interviewed. ERSA (Education Recovery Support Activity), funded by the U.S. Agency for International Development (USAID), provides essential educational services through accelerated learning programs and also promoting peace building and resilience through the use of culturally appropriate lessons and activities. ERSA will reintegrate more than 10,000 out-of-school children into the education system. Food for Education 3 (FFE3) seeks to reduce hunger and boost literacy and primary education, especially for girls. EDC uses its successful Read Right Now early-grade balanced literacy program for this five-year program, which leverages gains produced by Catholic Relief Services. It is funded by the USDA, and the McGovern-Dole International Food for Education (FFE) and Child Nutrition Program. USAID/SIRA (Selected Integrated Reading Activity) is funded by USAID and implemented by an EDC-led consortium. It improves reading and writing instruction to improve the abilities of 1st and 2nd graders to read and write in the Bamanankan mother tongue. The project seeks to enhance reading outcomes, strengthen the Ministry of Education’s capacity to foster sustainability of literacy initiatives, and increase parent and community organizations involvement in supporting reading and in the life of the school. PACETEM (Access to Education for All Children in Mali) increases access to quality education and student retention across all regions in Mali. The program will directly benefit 600,000 children currently not in school. The program is funded by the Educate a Child Program of the Education Above All Foundation in Qatar. AEEQ II: Funded by USAID and implemented by UNICEF, this project trains Ministry and NGO counterparts to train facilitators in nonformal education centers to use interactive audio instruction (IAI) programs. IAI programs in Mali provide lessons in basic math and literacy in the Tamasheq and Songhay languages for out of school children. The project is also introducing tablets as training supports for school directors and teachers in formal schools.